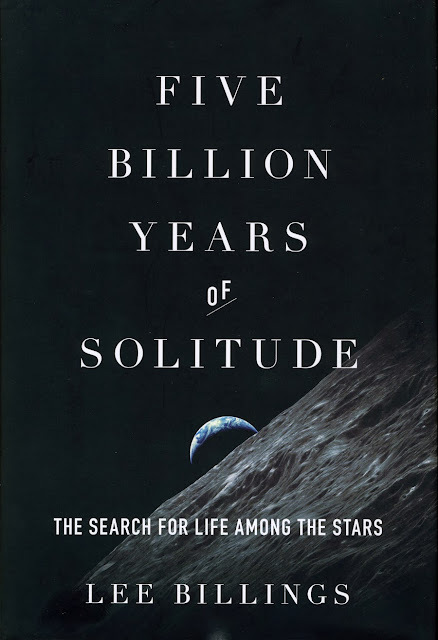 Lee Billings is the author of Five Billion Years of Solitude: The Search for Life Among the Stars (2013), "an intimate history of Earth and the quest for life beyond the solar system. Through these and other captivating tales, Billings traces the triumphs, tragedies, and betrayals of the extraordinary men and women seeking life among the stars. In spite of insu cient funding, clashing opinions, and the failings of some of our world’s most prominent and powerful scientifi c organizations, these planet hunters will not rest until they fi nd the meaning of life in the infi nite depths of space. Billings emphasizes that the heroic quest for other Earth-like planets is not only a scientifi c pursuit, but also a refl ection of our own culture’s timeless hopes and fears. Billings discussed his new book a few days ago at Google. Since its formation nearly five billion years ago, our planet has been the sole living world in a vast and silent universe. Now, Earth's isolation is coming to an end. Over the past two decades, astronomers have discovered thousands of "exoplanets" orbiting other stars, including some that could be similar to our own world. Studying those distant planets for signs of life will be crucial to understanding life's intricate mysteries right here on Earth. In a firsthand account of this unfolding revolution, Lee Billings draws on interviews with top researchers. He reveals how the search for other Earth-like planets is not only a scientific pursuit, but also a reflection of our culture's timeless hopes, dreams, and fears.